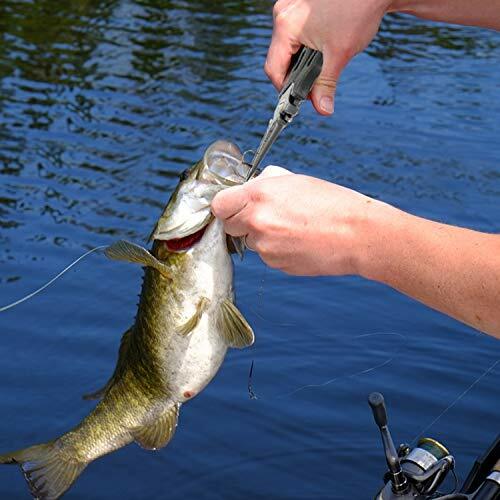 Having a pair of the best fishing pliers while you are out on the water might seem trivial, but convenience while you have a fish on the line is something that I look for. 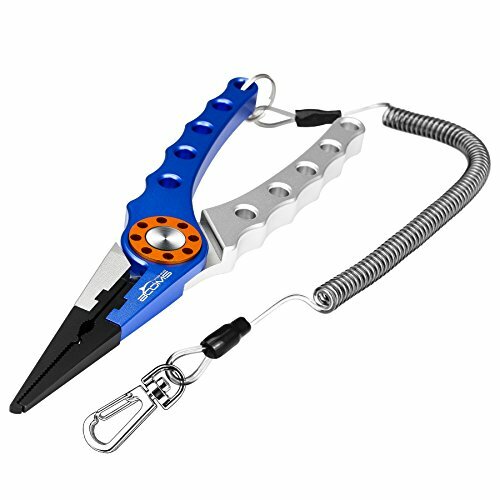 The best fishing pliers split rings quickly, remove hooks easily, are low profile and are conveniently used with one hand. A pair of the best fishing pliers will replace traditional fishing needle nose pliers, regular pliers and a pair of nail clippers. Does that sound familiar to your tackle box? And have you ever opened them to find them rusty? I sure have, and finally invested in a fishing multi tool plier. Many fisherman go without a pair of fishing pliers, and I was one of them for a long time. But once I got my hands on a pair of the best fishing pliers, I never went back. I put this guide together to help others get their own pair, or buy one as a gift for someone else! There are so many out there, it can be daunting to choose which one is the best one for you, but after reading this guide I hope it helps you pick one! To extend the life of your fishing pliers, after each use rinse and clean them in fresh water. Ensure any salt or dirt is removed from the plier’s surface. Dry them completely, but not in the sun, as it will dry out the lubricant oil. Fill the rivet with lubricating oil, open and close a few times. Then remove any excess oil. Please note that these are usual care procedures but follow the manufacturer’s directions for the specific pliers you have purchased. After exposure to salt water, ensure you clean off your pliers with fresh water and allow them to completely dry. This applies to almost all gear that comes into contact with salt water. 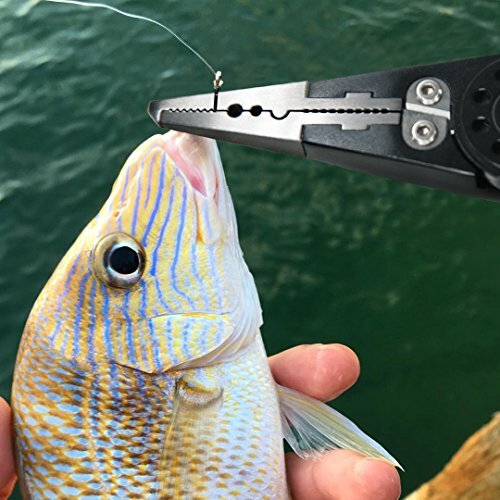 These fishing pliers from Piscfun are designed for freshwater and saltwater, made of high quality materials and are designed to make removing fishing hooks easy. There slim design means they do not get in the way when looking for a hook inside the fish’s jaws. They are made of durable titanium-coated stainless steel and feature extremely sharp tungsten carbide cutters. These are capable of cutting braid fishing line, mono line, fly line and backing line. One of the design benefits is the line cutter at the bottom of the mouth of the pliers. These fishing pliers have a lanyard and sheath, which makes carrying them around easy. >> Click here to check the price and read more reviews. These fishing pliers by Booms are designed for saltwater or freshwater fishing. They are also able to cute through tough braid line and are prefect for splitting rings quickly and removing hooks. 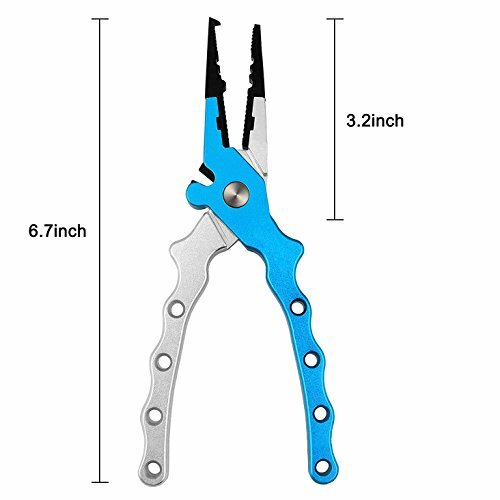 Like other aluminum fishing pliers, they are corrosion and rust resistant. The Booms Aluminum fishing pliers have stainless steel jaws that are designed for strength and durability. The H1 fishing pliers from Booms are designed for kids and have a different design than most of the other popular fishing pliers on the market. They are the classic design from Booms, and also their economical model. 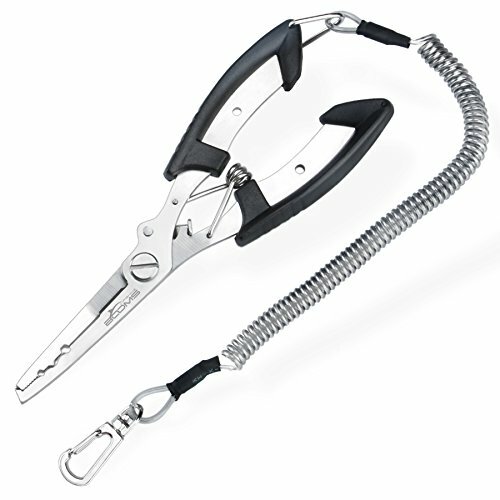 Like typical fishing pliers, these junior fishing pliers have a coiled lanyard to keep them close at hand. They can crimp, split rings and cut lines. They can also be locked closed when not in use. A nice safety feature when you have your children using sharp objects! These are designed by Booms for young anglers and are not made for a heavy load. Keep that in mind when you purchase them. I like that these are slim, making hook removal easy. 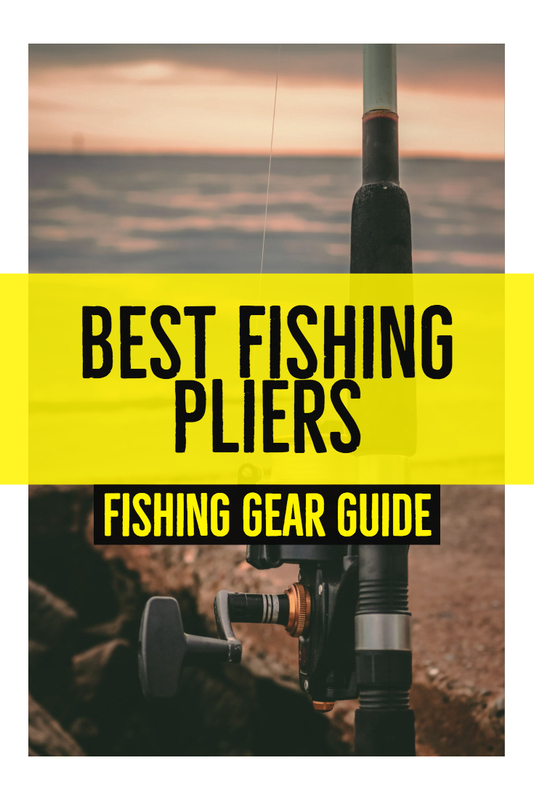 They are one of the cheapest fishing pliers on this list, but their workmanship is designed for small hands, not adults out on the water. >> Click here to read reviews and check prices. Made of aircraft grade aluminum, the Wolfyok fishing pliers are saltwater resistant. They also have titanium coated stainless steel jaws making them durable. They also have tungsten carbide cutters, which mean they can stand up to braided lines. Ergonomic and spring loaded, they come with a sheath and wire coiled lanyard. >> CLick here to read more reviews and check prices. The Manley Professional Saltwater Pliers are one of the best fishing pliers for those who spend a lot of time saltwater fishing. They are a bit more expensive than the other pliers in this review, but have an extra coating to protect the tool from the harsh salt water. They have tungsten carbide cutters which means they can braided fishing lines. 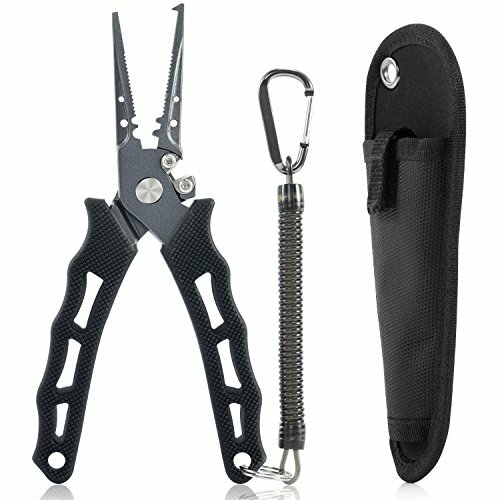 As with the other fishing pliers listed, it comes with a sheath and lanyard. Convenience and close at hand is important, so I like that the makers of these fishing pliers make them easy to grab! stainless steel designed for lots of saltwater fishing. These SUAOKI fishing pliers are made of stainless steel and have aluminum handles. They are made of quality materials, and the stainless steel jaws are corrosion resistant. The Aluminum handles make them lightweight. 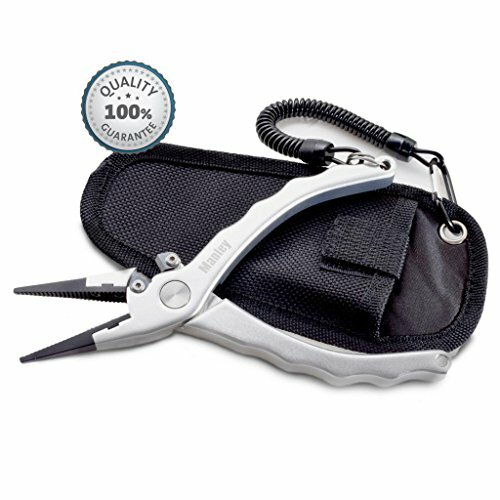 It is made with tungsten cutters for strength, allowing these fishing pliers to cut braided and leader lines. It comes with a sheath and coil lanyard. The fishing pliers from Plusinno have great reviews online. They are well priced and built to last. With tungsten carbide cutters and a stainless steel build, they are not prone to rust. Their design is light and ergonomic, with a spring loaded handle. 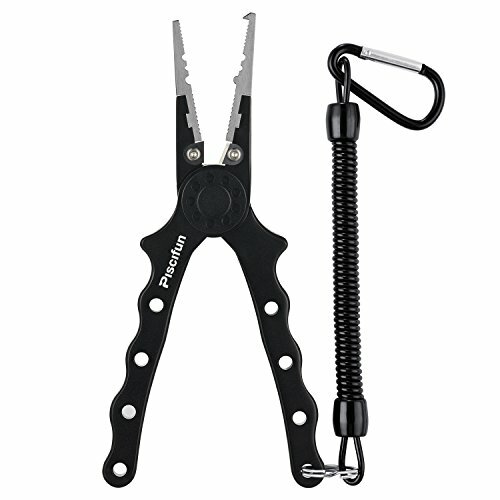 The Plusinno fishing pliers come with a lanyard and sheath. 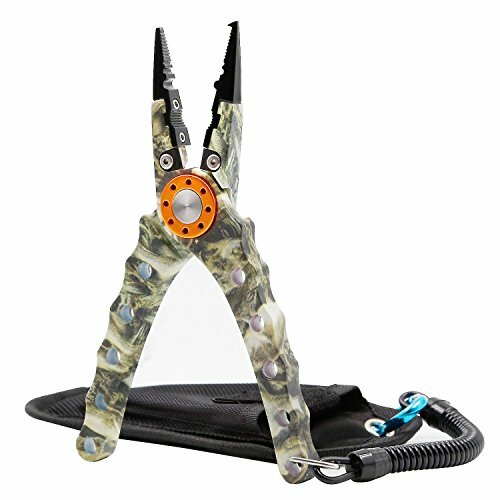 The SANLIKE Aluminum Fishing Pliers come in a cool camo print, but they are not just a pretty face. They are corrosion resistant, are designed for strength and durability and are comfortable and easy to use. The Sanlike pliers can split rings with ease and cut tough lines without trouble. >> Click here to read reviews and check price. All of the pliers above are more or less in the same price range. They are efficient and useful for the typical fisherman like me, but there are also options that are quite a bit more expensive. They are ideal for the commercial fishing guide who is going to use their gear a lot more often than a leisure fisherman like myself. But if you want to hang on to your pliers for years to come, a pair of high-end pliers are worth the investment. Why replace something every couple of years when you can get a premium product, but you will pay for it. A pair of the best fishing pliers is an essential part of my fishing tackle. They are used EVERY TIME I am out fishing, whether in my fishing kayak or on the shore. Most of these fishing pliers have similar features when it comes to cutting ability and build. All can cut braided hoses and all are durable to some extent. 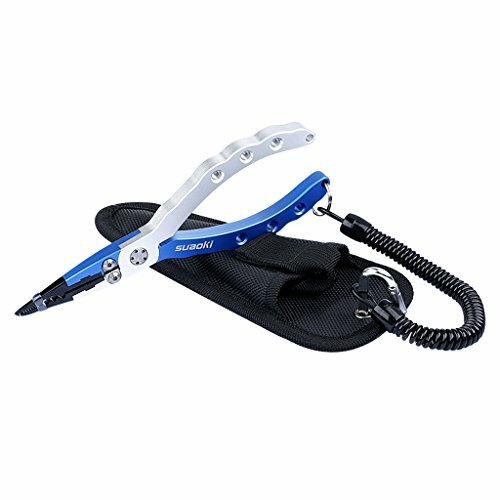 If you are unsure on which fishing pliers you want, I would suggest you go for the Piscfun Fishing Pliers. If you still have questions, feel free to leave a comment below or contact me.